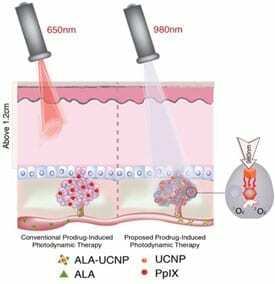 Research by Gang Han, PhD, shows that upconversion nanoparticles that can convert near-infrared light into red light can be used to extend photodynamic therapy for some cancers found in deeper tissues. An international group of scientists led by Gang Han, PhD, has combined a new type of nanoparticle with an FDA-approved photodynamic therapy to effectively kill deep-set cancer cells in vivo with minimal damage to surrounding tissue and fewer side effects than chemotherapy. This promising new treatment strategy could expand the current use of photodynamic therapies to access deep-set cancer tumors. In photodynamic therapy, also known as PDT, the patient is given a non-toxic light-sensitive drug, which is absorbed by all the body’s cells, including the cancerous ones. Red laser lights specifically tuned to the drug molecules are then selectively turned on the tumor area. When the red light interacts with the photosensitive drug, it produces a highly reactive form of oxygen (singlet oxygen) that kills the malignant cancer cells while leaving most neighboring cells unharmed. Because of the limited ability of the red light to penetrate tissue, however, current photodynamic therapies are only used for skin cancer or lesions in very shallow tissue. The ability to reach deeper set cancer cells could extend the use of photodynamic therapies. March 27, 2019 - Line of Duty star Adrian Dunbar says his tough cop character would sort Brexit Irish MirrorAdrian Dunbar, 60, says his character Ted Hastings in the BBC1 drama would give the EU's Michel Barnier and Donald Tusk an "interrogation"
March 6, 2019 - Israel dubs Hamas-linked TV channel 'terrorist group' Anadolu AgencyIsrael has officially classified the Hamas-linked Al-Aqsa television channel, which broadcasts from the blockaded Gaza Strip, as a “terrorist” group. February 26, 2019 - Martin Clunes set to play detective Colin Sutton again in hit TV drama Manhunt Irish MirrorEXCLUSIVE: The ITV series about how serial killer Levi Bellfield was caught by the Met Police pulled in up to nine million viewers earlier this year. July 17, 2018 - Study Finds Links Between ADHD, Digital Media Use Among Teens Times of San DiegoTeenagers who spend too much time glued to digital devices are more prone to developing attention-deficit/hyperactivity disorder, according to a USC study.